Martha McSally ousted Democrat incumbent Congressman Ron Barber in the 2014 Elections and won election to Arizona's 2nd Congressional District. 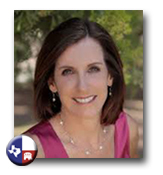 Retired Air Force Colonel Martha McSally is a pioneer, leader, servant, and fighter. She is the first female fighter pilot to fly in combat, and first to command a fighter squadron in combat in United States history. In 2001-2002, Martha McSally earned national recognition for successfully overturning a military policy requiring all U.S. servicewomen to wear a Muslim Abaya and headscarf when off base in Saudi Arabia. She has extensive education and experience in national and international security, public policy, and transformational leadership. Martha retired from the United States Air Force as a colonel in 2010. She has made her home in Tucson for a number of years, first arriving in the Old Pueblo in 1994, the first of her four assignments to Davis-Monthan Air Force Base. Martha was and is very involved in the Tucson community. She is a former recipient of the Tucson YWCA Women on the Move Award. And in 2002, the Tour of the Tucson Mountains bike race was dedicated to her. Two years later, the Women’s Studies Advisory Council at the University of Arizona recognized Martha as one of three “Women Who Lead”. Martha served as a board member of Teen Challenge of Arizona, an internationally renowned faith-based addiction recovery program she still supports today. Additionally, Martha currently serves as Commissioner on the Pima County/Tucson Women’s Commission. Colonel (retired) McSally is a Distinguished Graduate of the United States Air Force Academy, and earned her first Masters Degree, in Public Policy, from the John F. Kennedy School of Government at Harvard. She earned a second Masters in Strategic Studies from the U.S. Air War College, where she graduated #1 in her class out of 260 senior military leaders. In January 1995, Martha flew her first combat mission into Iraq to enforce the United Nations’ “no-fly zone” while deployed from Davis-Monthan Air Force Base. During that assignment, she flew almost 100 combat hours on two tours to the Middle East in support of Operation Southern Watch. After her duties in the 354th Fighter Squadron, Martha was chosen to become an A-10 Instructor Pilot in the 358th Fighter Squadron, the first woman in U.S. history in that role. In 1999, Martha was one of only seven active-duty Air Force officers selected for the prestigious Legislative Fellowship Program, working on Capitol Hill and serving as a national security advisor to Senator Jon Kyl on issues including terrorism, cyber security and missile defense. After her time in the Legislative Fellowship Program, Martha was assigned to a remote tour in Saudi Arabia where she was responsible for combat search and rescue operations for all coalition aircraft enforcing the “no-fly zone” over southern Iraq and Afghanistan. Martha was there for 9/11, and played a key role on the leadership team that planned and executed the initial air-campaign in Afghanistan. She returned to Tucson in December 2001, and became a Flight Commander and then the Director of Operations in the 612 Combat Operations Squadron at 12th Air Force Headquarters at Davis-Monthan AFB. While there, Martha deployed twice back to the Middle East, holding various leadership positions in the Combined Air Operations Center controlling the air campaign for Operations Southern Watch, Enduring Freedom, and then Iraqi Freedom. In July 2004, Martha took command of the 354th Fighter Squadron becoming the first woman in U.S. history to command a combat aviation unit. In that role, she led her A-10 team on a combat deployment to Afghanistan in support of Operation Enduring Freedom from September 2005 until February 2006. Flying over 225 combat hours during a period of increased combat activity, Martha was awarded a Bronze Star and multiple Air Medals for her combat leadership and performance. Under her command, the 354th Fighter Squadron won the prestigious Air Force Association David C. Schilling Award for the most outstanding contribution in the field of flight in 2006. Martha’s spent her final military assignment as a hand-picked leader to standup United States Africa Command, formed to address U.S. security threats emanating from Africa. She led planning and oversight of complex and sensitive counter-terrorism missions, counter-piracy operations, and other military operations and engagements on the continent. She retired as a command pilot with over 2600 flight hours, including over 325 combat hours. Before resigning to run for Congress in 2012, Martha served as a Professor of National Security Studies at the George C. Marshall Center in Germany where she taught and mentored senior government officials from all over the world in international and national security issues. In addition to her military commendations, Martha was a regional finalist for the Rhodes scholarship and a White House Fellowship National Finalist. She earned an Honorary Doctorate in Civil Law from Rhode Island College and a Lifetime Achievement Award from the National Center on Women in Policing. The Freedom Forum named Martha as one of three national winners of the 2002 Al Neuharth Free Spirit Award. Martha is an accomplished triathlete, winning the National Military Triathlon Championship multiple times and the Military Division of the grueling Hawaii Ironman Triathlon. She has run many marathons, climbed many mountains including Mt. Kilimanjaro and Mt. Blanc, and is a certified paragliding pilot. Martha loves the outdoors and animals and is a talented singer as well. In 2012, Martha came within .84% of unseating incumbent Ron Barber in Arizona’s Congressional District 2 race. "America is $17 trillion in debt and growing, and we cannot continue to spend recklessly and hand this debt to future generations. Getting our fiscal house in order is not just about budgets; it’s an economic imperative. A government that spends within its means spurs growth, protects investments in critical government functions, and ensures we hand future generations a strong and secure country."